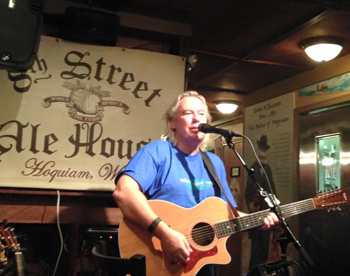 My last update was in October, since then I played my last gig of the season in Kells, Portland, OR followed by my last one in Mahers, Lake Oswego, OR both were great endings to a very nice Summer / Autumn in the Pacific Northwest. In Mahers there was a great turnout of friends and supporters - to all who came along (and those who showed their support while I was back) - thank you !! It was great to be there. 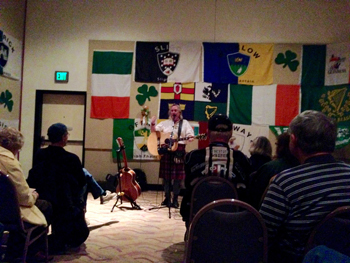 We then packed up all our stuff (I mean all... as we were heading off on our travels again) and drove to Ocean Shores - I was playing at the Galway Bay Irish Festival - the biggest on the West Coast of the USA. There were over 30 bands over the 5 days and 10 stages which we rotated through - a major feat of logistics... aided by many pints of Guinness. 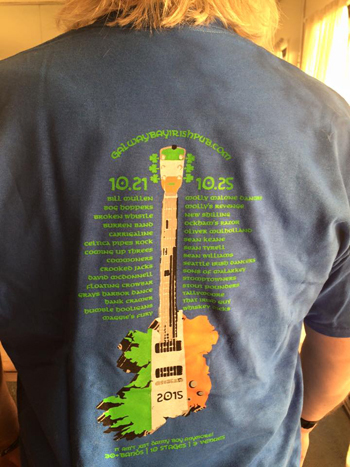 It was my 1st time playing at the Galway Bay festival... I had heard it was good - but I really never expected it to be as huge, and good as it was. The next day, Thursday, I started off in the beer garden at 1pm - not used to early starts - I played as many low songs as i could. I then played the main stage at 4pm - what a crowd! Incredible, for that time and day the place was packed, in fact the place was sold out from then onwards. It was a great afternoon, they loved it and so did I. My last hour was 7pm in the tasting room. I thought the crowd would be mainly people who missed the 4pm session - but no, I also had a flock of enthusiasts who had been to more of my sessions. Great!! On Friday I was over in the conference centre for an early start at noon (we finished Thursday at an after party with people from Hawaii and the band Celtica ... so it was the worst kind of early start!). Outside the centre we had to go past the religious extremist protest with banners telling us drinkers we were doomed ... to be honest, I felt pretty doomed at that point - but I didn't repent on the spot, the show must go on. I thought it'd be a quiet show - but no, the place filled up and away we went again. My next and last one was at 5pm in the tasting room. I have to admit, Dorothy and I slipped off for a wee sleep in the afternoon - the pace was beginning to tell - with my broken ankle in the early stages of independence from its big boot, it was also beginning to complain. 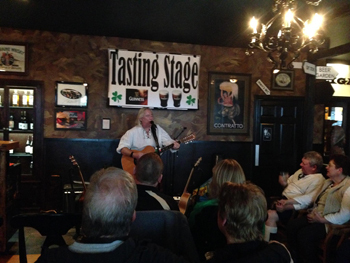 My last set went great - again I had people who had been to several of my shows, bought CDs and enjoyed every minute. When I played the last song (guess what that was) I could pack up, relax and enjoy the rest of the festival - Dorothy and I were also staying for the Saturday. Saturday was brilliant, we watched many bands, drank many beers & whiskies (obviously still doomed) and had a great time with many friends - old and new. I really enjoyed getting to hear what the other artists are doing - normally I don't get to do that as I am playing when they are. 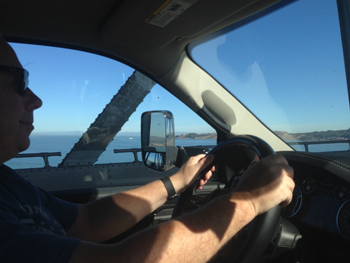 With the sounds of the festival still ringing in our ears, we headed south picking up our big home on wheels , all fixed up and ready to go as we passed Portland. We stopped a few times on the way down to San Francisco and managed to see Shakespeare's "much ado about nothing" when we stopped over in Ashland, Oregon. 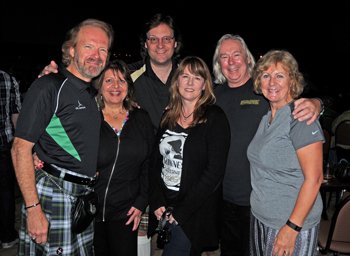 In San Francisco, we parked up our 5th wheel and truck, spent some great times with friends Avril & Sandy, then headed off to Dundee, Scotland - to celebrate my 60th birthday, see family and friends, drink and eat to excess and also play some music. I also played two afternoon shows for care homes, one in the Orchar in Broughty Ferry and another in Wellburn where my mum used to live. I've talked of these things before - but they are the most rewarding dates, the old folk realy love the music and I really enjoy seeing them come alive as they get involved. 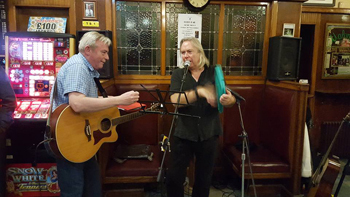 And a visit to Dundee wouldn't be complete without a gig in the Clep Bar wi' my pal Pat Ferrie. 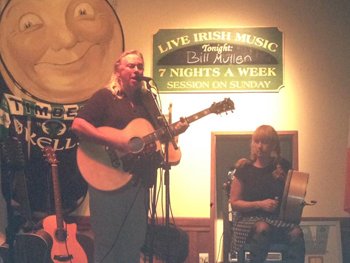 It was good to see the familiar faces, laugh, sing and hear Big Tam perform Star o' the Bar!! We're now in the Netherlands, in the wee village where we lived for many years called Ugchelen. I'm playing in the local pub (Café Back in Town) on Friday December 4th at 9pm, the day before Sinterklaas (Dutch Santa Claus). The Back in Town is a great wee pub, very welcoming, serving great Hertog-Jan beer and the best Saté you will find. Bookings for San Diego when I return to the US in December are still in the works and other dates for the rest of the trip are firming up - I will put them on my website and facebook - and the next newsletter when they are agreed. People have asked me many times about writing my own material and I have had several attempts good and bad but nothing I would want to expose an audience to. In the middle of the night after my 60th birthday I woke up with a song idea, and another and another... in the end I jotted down 10 potential songs which I will work on when we're static in San Diego. All going well, my plan is now to bring out an album of my songs next Summer. There - I said it, now I have to do it!